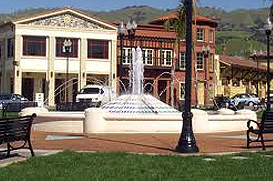 The Evergreen area of San Jose is a large district of Southeast San Jose. The area is surrounded by Tully Road to the north, US 101 to the west, San Felipe Road to the south and the East Foothills neighborhood to the east. Most of Evergreen is suburban residential development with many strip malls and shopping centers. Western Evergreen neighborhoods tend to be lower-middle class to middle class, while the Eastern areas are upper-middle class to upper-class. The southeastern area of Evergreen is home to multi-million dollar homes and the gated Silver Creek Valley Country Club. Residents of the western portions are largely Hispanic, while the eastern areas have a very large Asian population.